Relenza | The Flu | Dokteronline.com Helps You Along! Relenza is an antiviral medicine. It contains the active ingredient zanamivir, a type of medicine that is used to treat infection with the influenza virus (flu virus). Relenza is inhaled via the mouth. This deposits the medicine in the lungs, where it can attack the virus. Relenza is a prescription-only medicine. It is suitable for use in adults and children aged five years and above. Relenza is used to treat common types of the flu virus. It prescribed when treatment with other antiviral drugs (e.g. Tamiflu) is not possible or has been unsuccessful. Relenza is used to prevent and treat the flu. It should not be used as a substitute for being vaccinated against seasonal flu. Antiviral drugs such as Relenza or Tamiflu are usually prescribed to people who are at risk of developing flu complications such as people with diabetes, lung and heart patients or elderly people. Relenza inhalation powder comes packed in blisters on circular foil disks (rotadisks). 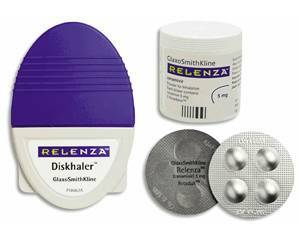 The disks are used in a type of inhalation device called a diskhaler. The diskhaler pierces the blister when it is used and the powder is then inhaled through the mouthpiece. Follow the instructions in the package leaflet provided with the diskhaler. To treat the flu, you should start using this medicine as soon as flu symptoms appear. Adults must be able to start treatment within 48 hours of the symptoms starting. Children should start treatment within 36 hours of the symptoms starting. To prevent the flu, adults and children must be able to start treatment during a pandemic or directly after being exposed to someone who has the flu. Always complete the entire course. Adults and children aged five years and over should inhale the contents of two blisters twice a day for five days using the diskhaler provided. Adults and children aged five years and over should inhale the contents of two blisters once a day for 10 to 28 days using the diskhaler provided. The duration of treatment should be established by a doctor. Read the package leaflet before use. Relenza is not suitable for children under five years of age. Narrowing of the airways (bronchospasm) following inhalation. If you suffer from asthma or chronic obstructive pulmonary disease (COPD) you have a greater chance of this. You should have your reliever inhaler at hand when you are taking this medicine, so that you can use it to relieve shortness of breath in the rare event that this side effect occurs. For more information on side effects, see the package leaflet. You are allergic to zanamivir or any other ingredient in this medicine. Consult a doctor on the use of this medicine if you have a lung or respiratory disease. Relenza should be used with extreme caution in this target group. For more information on contraindications and interactions, see the package leaflet. The safety of this medicine for use during pregnancy has not been fully established. Therefore, it is not recommended for use in pregnancy and while breastfeeding unless otherwise advised by a doctor. This medicine does not interact with alcohol or affect your ability to drive safely.